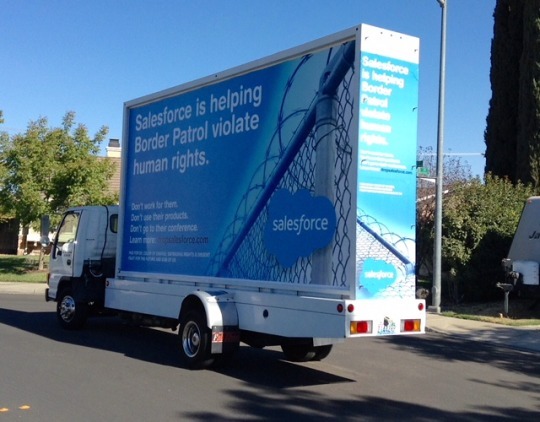 Activists have constructed a 14 foot tall metal “detention center” outside Dreamforce–– Salesforce’s flagship conference in San Francisco, and have deployed a mobile billboard, which is circling the convention area, calling on the company to drop its multimillion dollar contract with US Border Patrol. A growing coalition of national and local organizations including Fight for the Future and Mijente have been pressuring Salesforce co-CEOs Marc Benioff and Keith Block to cancel the contract, following widespread reports of human rights abuses carried out by US immigration authorities. . 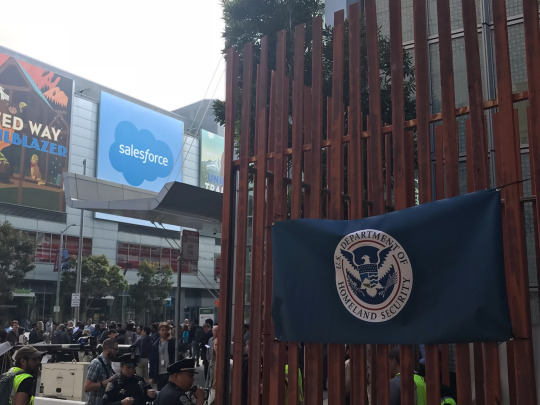 Dozens of organizations, and more than 300,000 people, have echoed the call for Salesforce to stop providing an operational backbone for US Border Patrol’s activities. Salesforce executives have continually refused, made excuses, and attempted to sweep the issue under the rug. In response, RAICES, one of the nation’s leading immigrants rights groups, recently refused a $250,000 donation from Salesforce, and Wrecking Ball Coffee Roasters pulled out of catering Dreamforce. Fight for the Future and other groups launched DropSalesforce.com and are planning additional protests online and off surrounding the Dreamforce conference. “CEO Marc Benioff continues to deny Salesforce’s role in upgrading Trump’s deportation machine as Trump grows his Border Patrol workforce with the help of Salesforce’s Community Cloud. Stop downplaying your role in the suffering of our communities, and cancel the contract,” said Marisa Franco, co founder of Mijente. “We urge Marc Benioff and Salesforce to cancel the contract with customs and border patrol and to stop profiting from the forced separation and detention of innocent families on our borders,” said Maria Noel Fernandez, campaign director at Silicon Valley Rising. "While Salesforce is partying at Dreamforce, children separated from their families at the border are having their dreams crushed. We’re making our presence known at Dreamforce and inviting their headline speakers Al Gore and Will.i.am, their employees, and their clients to join our chorus and tell Marc Benioff: Cancel The Contract,” said Tihi Hayslett of Demand Progress.